At the height of her popularity in the 60s, she began to get more screentime. Her character was often a seductive vamp, trying to tempt either the hero or the villain of the film. 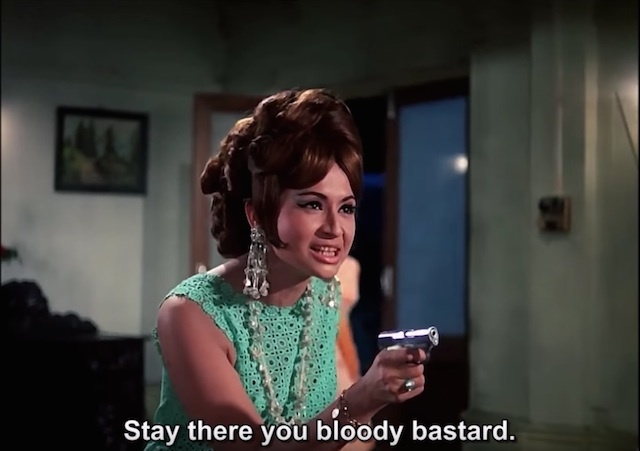 Other times she played characters who tried to help the heroine (Caravan, 1971). She very rarely played the lead role, the most well-known instance being in 1964’s Cha Cha Cha. Her slightly exotic looks meant she was often cast as a mysterious foreign character. Her characters were often a lot more outspoken compared to the heroine of the film, as seen here in 1971’s Caravan. However, her forte was dancing. 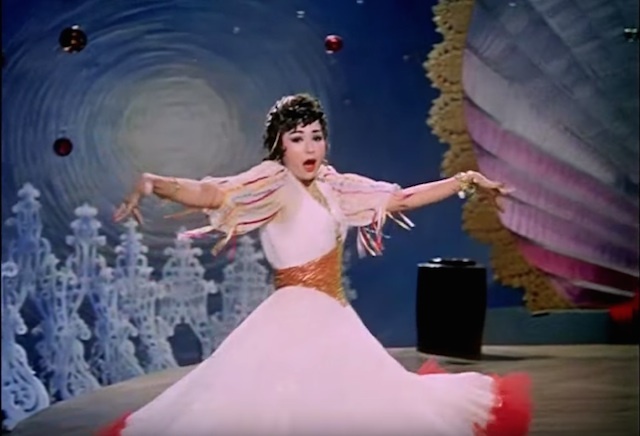 In many films, she only had a guest appearance in an item number or two. Proficient in a wide variety of dance forms, from the traditional kathak and mujra, to flamenco and jive, she performed a huge variety of pieces in many different settings. The most common settings for her dances were cabarets and bars. This was used to signify that the main character had wandered into a less reputable part of town. As well as Hindi movies, she also made appearances in films in other languages too, such as Tegulu and Tamil. The key to her long career lies not only in her dancing ability but in her charisma. Whereas other dancers merely lip-synced the lyrics- Helen put meaning into every word with her facial expressions and movements. Outside of the dance scenes, her lines were always delivered with dramatic feeling in her distinctive voice. Even when lip-syncing cheesy lyrics or doing a particularly silly dance, the apparent enthusiasm that she put in always improved the scene. She also had the ability to make even the most outrageous outfits look good. Even in atrociously bad films, Helen is a ray of light- tackling the role or dance piece with such vigour that it transcends the movie. Her dialogue delivery may be a little too dramatic for some but she certainly can never be accused of being wooden. She married Salman Khan in 1981 and stepped out of the limelight a few years later. However, in recent years she has made a few guest appearances in films- such as Mohabbatein (2000). In 1999, she received the Filmfare Lifetime Achievement award for her services to Indian cinema. Click to see our Top Ten pick of the must-see Helen dances from the 60s and 70s. 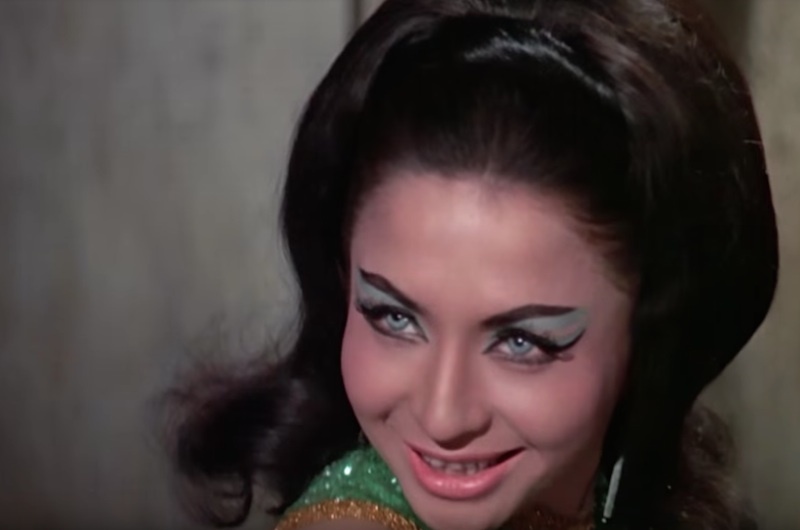 If you want to read more about Helen’s impact on Indian cinema, I recommend Jerry Pinto’s book Helen: The Life and Times of a Bollywood H-Bomb. He gives a great analysis of the typecasting in the roles that Helen was given, examining them through the lens of Indian society at the time. Into The Retroscope's founder. RetroRobin enjoys pecking out the forgotten classics and little knowns of yesteryear- specialising in cult Japanese films, 1960s Bollywood cabaret songs, British thrillers and old school adventure games.